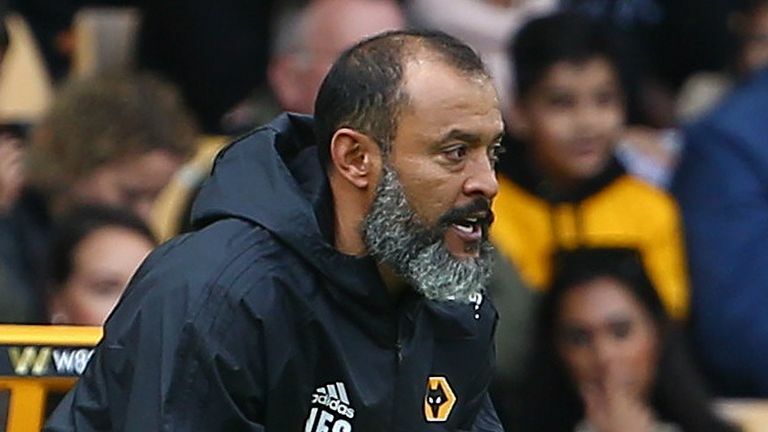 Nuno Espirito Santo has refused to be drawn on links with Manchester United as a potential future successor to Jose Mourinho. Reports from Germany surfaced last week claiming United have identified the Wolves boss as a viable long-term candidate for the Old Trafford hotseat. Santo was quizzed about the speculation by Sky Sports News reporter Rob Dorsett ahead of Wolves' clash with Burnley on Sunday - live on Sky Sports Premier League. Asked what he made of United's reported interest and whether it flattered him, Santo said: "You know me. I don't talk about that. It does not make sense. "This is not the moment to even think about it. I don't think about it, I totally ignore that, I totally ignore it." Asked if he aspired to one day manage a club the size of Manchester United, Santo said: "I don't do like that. I go on a daily basis. "I know what I have to do tomorrow - to prepare the boys well and prepare the team for a tough game against Burnley. This is the way I look at the future I take it day-by-day." Wolves head into this weekend's clash with the Clarets boosted by notching their first win of the season after Adama Traore's dramatic added-time strike earned them a 1-0 victory against West Ham just before the international break. "The most important thing is that we established standards in the last game, and we have to maintain those standards," Santo said. "Winning is always good and makes things a lot easier when you are trying to establish an identity like we are. We won in the last minute as well, which gave us a bit more of that push, but we have to do it again."